With the Lobster Club, a revered playground for New York City power players officially completes its transformation by Major Food Group. The story of the Midtown Manhattan space that just reopened as The Lobster Club is a bit like a chain novel penned by architects: Over the past 60 years, Ludwig Mies van der Rohe, Philip Johnson, Diller Scofidio + Renfro, and now Peter Marino have each written a chapter. 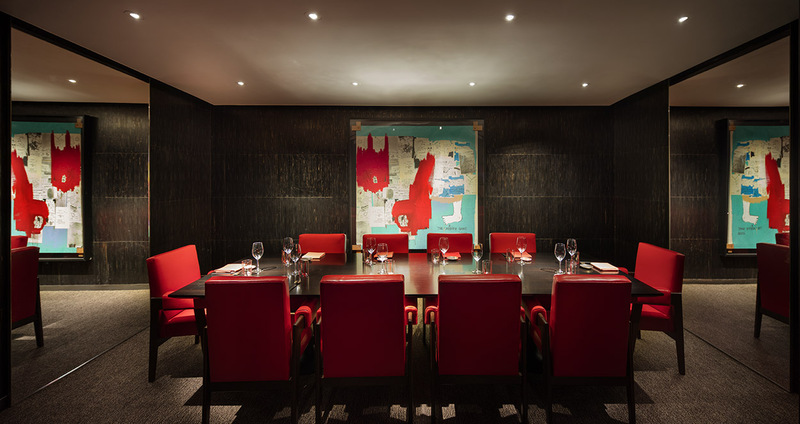 Helmed by chef Tasuku Murakami, previously of the Michelin-starred Sushi Azabu, the new Japanese concept completes Major Food Group’s reboot of the three restaurants in the Seagram Building, Mies van der Rohe’s 1958 apotheosis of International Style architecture. From the onset, the dining juggernaut envisioned the trio as one interconnected project with varying degrees of intervention: an architectural chronology that honors the heritage of the space while introducing new layers. On the first floor, the original Four Seasons—credited with the invention of the power lunch—has been divided into The Grill, a masculine steakhouse that harks back to the Mad Men era, and The Pool, a more feminine seafood joint named for its marble basin. Thanks to the landmark designation protecting Johnson’s original interiors, both rooms, refurbished but largely left unchanged, live on as historically sensitive retrospectives. The Lobster Club, located beneath The Pool, in the shell once occupied by boisterous 24-hour diner Brasserie, was constrained by no such laws. The interior—originally designed by Johnson, then renovated by Diller Scofidio + Renfro after a fire tore through it in the ’90s—was allowed to run free. Enter Peter Marino, renowned for his audacious Louis Vuitton and Dior stores, to radically transform the room where he once savored post–Studio 54 breakfasts before sunrise, sweeping it with his signature black leather, here in the form of a massive curtain. “Part of the design process was to pay respect to Mies, but to push forward and evolve the space into a playful experience without losing sight of the restaurant’s history,” says Marino, who took cues from his forebears’ tendency to use a limited palette of fine materials, including travertine and oxidized bronze. In typical Marino fashion, everything—the lighting and midcentury–inspired furniture, the soy-sauce dishes and sushi platters—was designed specifically for this project, his first restaurant in North America. “Every element of the space is new, creating a more imaginative environment where guests can feel a little less inhibited,” says Major Food Group partner Jeff Zalaznick. 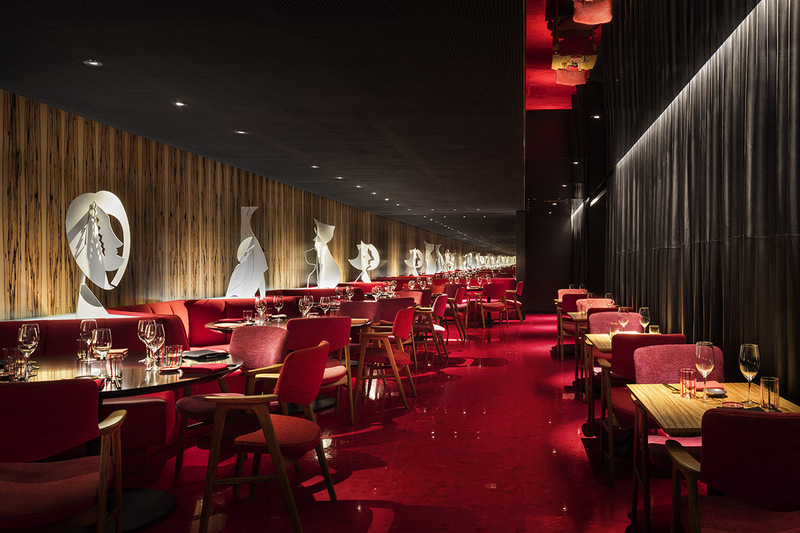 Luxurious details—a white-ebony partition, vixen-red terrazzo flooring—and splashes of bronze, coral, and chartreuse, fuse together for a thrilling effect. (“Mixed salads are always more interesting to look at than green-pea soup,” Marino says.) 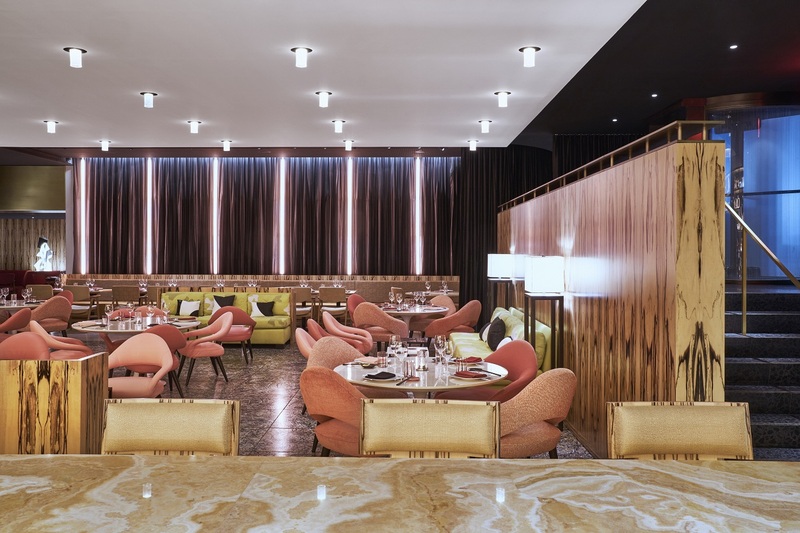 Meanwhile, the swivel barstools, modeled after those in Johnson’s original setup, which Marino’s team studied by poring through MoMA archives, and a quartet of see-and-be-seen tables visible from the entry, recall the glamorous bygone era of Manhattan dining. Overseeing the restoration of an institution as beloved as the Four Seasons leaves little margin for error—as evidenced by the project’s announcement in 2016, which was besieged with controversy—but Major Food Group was well equipped to tread that thin line. Anyone who’s ever successfully scored a table at Carbone, the group’s Greenwich Village paean to old-school red-sauce joints, can testify to its talent for harboring the past while pushing it forward. “The Lobster Club is escapism in the heart of Midtown,” Zalaznick says. 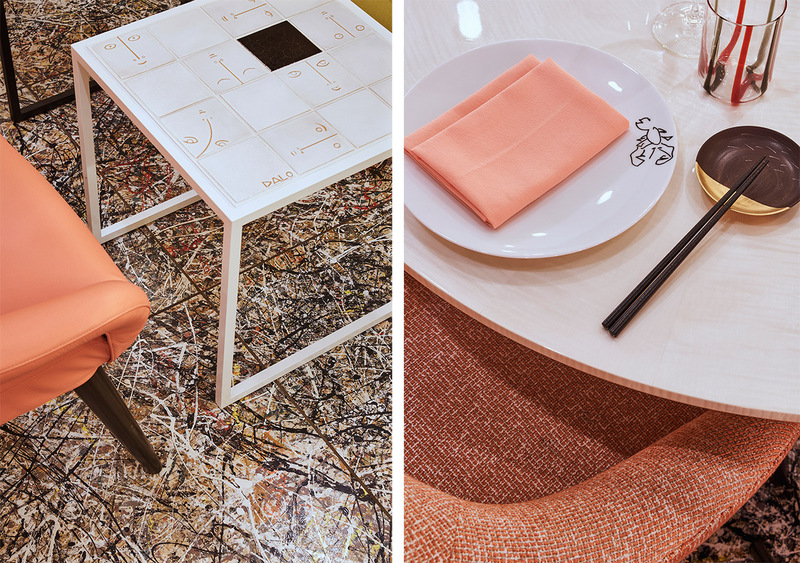 “As soon as you enter, you’re invited to dine on incredible Japanese food and sushi in the setting of an artist’s studio, with paint splattered on the floor, surrounded by beautiful art and sculptures. 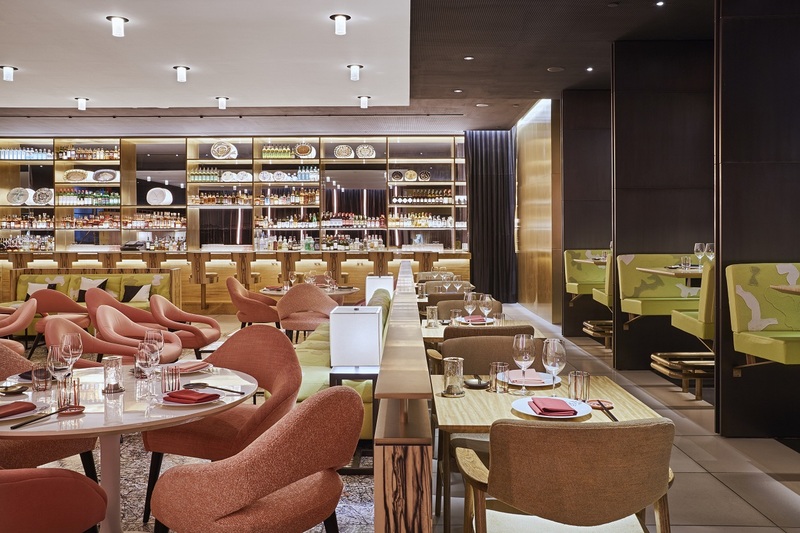 There’s nothing like it in the world.” In other words, in the prestigious club of architects who crafted the narrative of the Seagram Building restaurants, Marino’s chapter is sure to be a page-turner.